Personalised Mouse Mats are a great way to showcase your business and will look great on any desk. 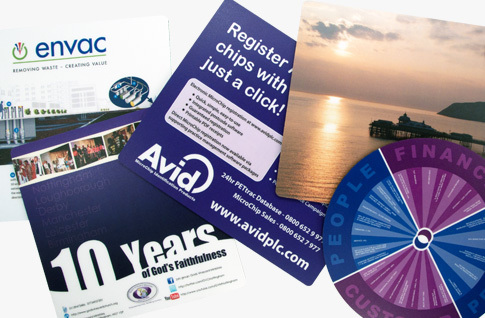 Full colour printing and available in a selection of popular sizes; we offer Square, Round, A4, A3 and Rectangular Mousemats. All are backed with a 3mm foam rubber base and are sealed with a textured, mark resistant and wipe clean surface. Personalised to your exact requirements and printed in full colour, you can be as creative as you like with your design. A vibrant image or photograph will look great or a popular choice with many customers is to add a 12 month calendar – enhancing their usability too! A great way to reinforce consistency across your branding is to use your corporate colours and company logo. Should you require some assistance, we have a team of experienced and professional designers who can help you to create the perfect personalised design; we offer an affordable fixed price design service with no hidden charges! Perfect as promotional gifts for giving away at conferences, network meetings and events. Their durability and functionality will ensure that they remain on your customers' desks for a long time; providing a constant reminder of your business. With such great prices, they really are an affordable, useful and popular marketing tool.